This is a fascinating timeline journey through Williams life, congratulating him on all his works of art. This book had some amazing quotes and the drawings really help to bring the book to life. It was a really informal book that taught me a lot of stuff i didn’t learn in school. I liked how the writer’s initials, DB, where on every page. I really dont understand this book but it has some quotes and has shakesperas time line. He was born after the medevil times. I would recommend this book for people who like history. Check out the fun and free events happening in a library near you. Go to the kids’ What’s On page for all the info. Can you swear like Shakespeare? 2016 marks the 400th anniversary of Shakespeare’s death. 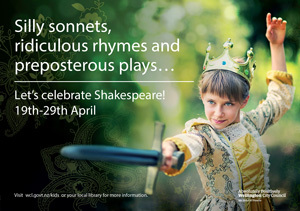 Throughout this year we will be celebrating Shakespeare, starting with the April School Holidays. Kids: want to have a go at swearing and insulting each other like Shakespeare? Come along to the library holiday events to have a go at our Shakespearean Insult Generator. We’re sure you will get a laugh out of it. We’ll also be looking at all the strange words Shakespeare invented, and have a go at writing with ink and quills (so don’t wear your best clothes). If you miss this you’ll be a loggerheaded clay-brained measle! Our School Holiday activities are suitable for 6-12 year olds. They are free and bookings are not required – just turn up.